Cast: Saoirse Ronan, Harry Treadaway, Tim Robbins, Bill Murray, Mackenzie Crook, Liz Smith, Martin Landau. Directed by Gil Kenan, adapted from the book by Jeanne Duprau. Story: A subterranean city confronts its doom. As kiddie adventures go, you could do worse than City of Ember. Or better. It's a bit of a bandwagon movie, this one. Watching the trailer will smack hard of The Golden Compass, Narnia and any of a number of effects-laden adventures - it's even a bit Goonies-ish, if you look hard enough. 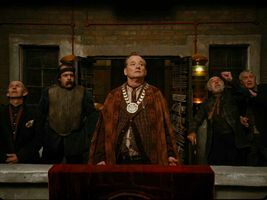 The titular City of Ember is an underground world, made by our own descendants after we'd pissed the overland world up the wall too much to make it habitable (ah - it's one of those storylines). Over the years, the truth of the overland world was lost, until a little girl finds a mysterious key ... and you can write the rest yourselves. Except you'd do a rather better job of making it plausible. The special effects are pretty nice in places, but everything else is rather ordinary. Tim Robbins never was that great, and Bill Murray isn't stretched in a one-dimensional king-of-the-city role. The kids try very hard, particularly the unpronounceable Saoirse Ronan (familiar from Atonement) but they're still kids - which will either be a positive or negative for you. I'm not really sure who it's aimed at - it's rather dense for a kids' movie, but far too flimsy for the adults. Early teen, perhaps, if you can prise them off their PSPs for long enough. Is it still PSPs these days? PlaySpace, iBox, whatever it is. 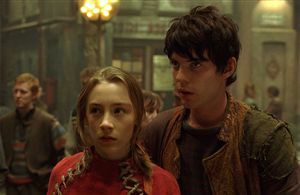 City of Ember suffices as a stop-gap until the next big-hitter comes along, but don't go out of your way to catch it. Pretty much all the animated movies (Bolt, Wall-E, Kung Fu Panda are better. To enjoy this film: be a wide-eyed early teen. City of Ember was released in the UK on 10th October 2008.